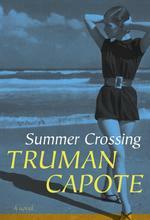 I must preface this review by confessing that Truman Capote is one of my favorite writers of all time. Much more than a talented wordsmith with a fascinating life, he is a glaring idol woven into the fabric of New York cultural history. Whether we breakfast at Tiffany’s with Holly Golightly to combat the mean reds, or pay a visit to Master Misery to sell our dreams for a lousy dollar, we travel the bleak and often consuming New York City streets with Capote always at our backs. Summer Crossing is no exception. It overflows with the curiously lonely nature of this overcrowded city, and brims with the possibility of losing one’s mind, oneself, to the hypnotic spasms of life and color that eek out from beneath every cracked section of sidewalk. Grady O’Neil is our on-again-off-again heroine, and we follow her moves and her mind as she discovers love and heartache and desire. O’Neil, like most of the author’s young female protagonists, embodies the qualities Capote attributes to New York City itself: desolation, coldness, vacuity, and conversely, tenderness and a longing to be loved that draws the reader to her, naive brat though she may be. The maudlin mood never seems to take over completely, which spares the story that certain loss of character that seems to infect the contemporary New York novel. Though the characters are vaguely painted, as if outlines themselves lying flat and unfinished in Capote’s wastebasket, the novel can be appreciated for its skillful prose and sentimental value, if not by a wide audience, then at least by Capote devotees such as myself. A girl’s journey into womanhood can be a lonely one—the phrase may overused and hard to swallow, but it’s true none the less. Capote possessed an understanding of this truth that is profoundly moving and perfectly set against that background of buildings tall enough to drown the girl out, and faces strange enough to make her introspective. I take issue here only with the question of whether Capote would consider this posthumous publication a triumph or a travesty. The flaws here remain unmended, and yet in full view of any reader who chooses to turn the pages. I suppose a partial resolution can be found in a forgiving reading of this novel, tempered always with the recognition of greatness when it is set before us. I recommend this novel, and all Capote has written, for those who seek an artful voice, mindful of grief and depth, and devoted to showing the other side of every ordinary life.